In a shocking video, a two-year-old girl was brutally attacked by a black dog who grabbed her by the leg and pulled her to the ground. This incident took place in Ahmedabad's Jamalpur town on Wednesday. According to Daily Mail, the little girl is seen wandering down a road when she was attacked by a savage black dog. She could not see the dog coming as she was facing away from the stray dog. Also, it pounced on her before she could know what is happening. 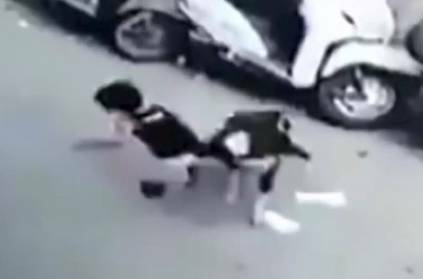 In fraction of minutes, the dog wildly shake its head to snap the girl's back or neck. Several bystanders immediately rush over to pull the toddler free while others hit the dog to make it lose of its grip on the little girl. Further media reports say that the little girl survived the dog attack and is currently being treated in hospital. This incident has made residents furious over excessive stray dogs in the area. 'பேசாமல் போன காதலி'...'காதலியின் 'மூக்கை கடித்து குதறிய'...காதலனின் வெறிச் செயல்! This page contains news relating to various facts and events. The views are generally about current affiars and general topics in diversified areas such as political, international, national, and regional issues, sports, health, travel, lifestyle, technology and business. People having similar interets on the above topics will find this page useful. Dog savagely attacks two-year-old girl, break her neck by shaking her | India News.